Hundreds of cave markings mistaken for graffiti, which are believed to be hundreds of years old, have been revealed as "witches' marks". The ice age markings are carved inside the caves at Cresswell Crags, on the border between Nottinghamshire and Derbyshire. But it appears the mystical art opens up a darkness that just a couple of hundreds of years ago was terrifying for those who were living nearby as they etched their fears on every surface. It is thought to be the largest collection of the medieval mystical shields ever found in the UK. Witches’ marks, or "apotropaic" marks, from the Greek word apotrepein, "to turn away", are commonly found in historic churches and houses, near doorways, windows and fireplaces, to protect the inhabitants from evil spirits. Among the most common are the double VV engravings, thought to reference Virgin Mary and Pace Maria, while other symbols are believed to be devices for trapping evil, including diagonal lines, boxes and mazes. 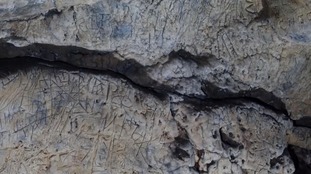 The discovery was made by enthusiasts Hayley Clark and Ed Waters, from the Subterranea Britannica group, during a cave tour when they noticed the rare protection marks on the walls. Ms Clark said: "We picked up on a couple of the joining Vs, they're quite faint but both of us knew that this was the sort of thing we had seen in other locations." "We never really thought it was escalate to something like this at all," she added. Their discovery means that markings intended for evil spirits can now be deciphered by historians. Tim Allen, Inspector of Ancient Monuments at Historic England, told ITV News: "It opens a door into this world that's only a few hundred years ago, but it's remote in some ways as the ice age." "We know sort of how people live their lives, but we know very little about what ordinary people thought on a day-to-day basis, how they believed the world was," he added. Until now the largest known quantity of witches’ marks in caves in Britain was 57 in Somerset, but the number at Creswell Crags is far higher - with hundreds in one cave alone and marks now found in all the caves at the site. There may even have been more in the past, as the caves were excavated by archaeologists during the 19th century and were widened in the process, potentially accounting for some surfaces featuring no marks. It is the latest significant discovery at the caves, which provided shelter for Neanderthal and anatomically modern people through a crucial period of human evolution between 130,000 and 10,000 years ago.